*The age where senior and geriatric periods start in dogs is highly variable. The senior period starts somewhere between 7 and 12 years as an average of all breeds and the geriatric period starts when the pet begins dealing with the problems and diseases of old age, which both are dependent on your dog’s breed with much breed variation. The median age of toy poodles (where ½ have died) is reported at 14-15 years and the oldest dog on record officially in the Guinness book of records is a Shiba Inu 26 years 9 months! As an approximation the average life span of small breeds is 16years, medium breeds is 13.5 years, large breeds 12 years and giant breeds 9.5 years. Senior years being those in the last 25% of a particular dog’s predicted life span (American Animal Hospital Association). 1. Annual Veterinary consultation and examination. Our focus for the annual consultation is on the physical exam. Everything branches from that. We give your dog a full physical examination covering all the body systems from eyes and ears to tail. We record the dog’s history, update the patient’s file, listen to your concerns and answer your questions regarding any problems you’re having with your pet. We have a check list to make sure we cover all areas. You will need to book another appointment for behavioural problems, because they take a lot of time to collect a detailed history, get the behavioural diagnosis and discuss behavioural modification and therapies. For this period in a dog’s life, once per year is adequate, but in the senior and geriatric years, or if your pet’s on chronic medications then twice a year consultations are preferred and recommended. DHPP (distemper, hepatitis [Adenovirus], parvovirus, parainfluenza) -all dogs. Core vaccine, but most important aspect is for the vaccination against Parvovirus. L (Leptospirosis) – all dogs unless almost strictly indoors with no contact to areas frequented by skunks and raccoons (contaminated soil/ water). Ly (Lymes) – mainly reserved for dogs that frequent areas where deer roam, such as cottages, farms and hiking in the Gatineau hills. This vaccine is often, but not always, required by dog obedience classes, dog groomers, dog kennels and it is a good idea at dog shows or where many dogs are held together indoors. R (Rabies) – required by law mainly to protect the public. This is a reportable, federally regulated disease that is lethal. It is expensive to treat post rabies exposure in people. Rabies vaccine lasts 3 years ONLY after it is boostered 1 year after the first priming vaccine. We believe at Beechwood Animal Hospital, to tailor and balance the amount of vaccines given to a pet in relation to the risk the patient has in acquiring the illness, and the academic known or believed duration of action of a vaccine (rather than the labeled duration). As such we commonly prefer to cycle vaccines to 2- 3 years, or more duration, once they have been properly boostered as a puppy and then re-boostered 1 year later. We prefer to cycle individual vaccines so they get as few vaccine injections as possible at one time. This will require us to go off-label with the products if we have your consent. Some vaccines like leptospirosis have no solid efficacy data to prove the protection afforded by the vaccine lasts longer than 1 year, so we need to do this annually, or consider off-label use in certain situations/ lifestyles with the owner’s consent. We balance these decisions in conversation with the client in relation to exposure concerns, age factors and lifestyle. If vaccine induced antibodies have declined below protective levels, then protection although delayed, comes from immunologic memory. It is general knowledge that the antibody duration and immunological memory developed with vaccines derived from bacteria (like leptospirosis, lymes and bordetella) is much less than from viral vaccines, and so these bacterial vaccines need more frequent vaccination boosters to stay within general accepted preventative beliefs. Long term duration studies are lacking though due to cost issues. If your dog has not been vaccinated with a puppy series, then recent vaccine guidelines suggest that DHPP does not need to be boostered 3-4 weeks later if it is a modified live vaccine and is given after 16 weeks of age. It should be boostered 1 year later and then rotated as suggested above. All the other vaccines are boostered 3-4 weeks later except intranasal Bordetella and Rabies (boostered 1 year after the first). Guidelines were adopted from the Canadian Animal Parasite Council www.capcvet.org. Adult dogs are generally not dewormed unless their stool analysis shows internal parasites, they have been diagnosed or exposed to fleas, or they are hunting dogs that eat game. Dogs acquire tapeworms mostly from fleas and from eating raw meat that contain tapeworm cysts. If there is history of fleas we need to treat for tapeworms regularly so long as we feel the dog is being bitten by adult fleas. This may be midway and at the end of flea treatment and perhaps the following year. Flea eggs can remain dormant for many months, potentially as long as 6-12 months in cold conditions. We advise a stool analysis be done 1-2 times per year. Please bring your pet’s stool in to be analyzed with your annual consult and/ or in the month of December. December is chosen as a good month to clear out any parasites because re-infestation from dog parks is highly unlikely, since freezing temperatures prevent deposited eggs on the ground from becoming infective. During the consultation we will look carefully at your dog’s teeth and look for gingivitis, gum recession, periodontitis to mobile teeth, broken teeth and the degree of calculus or tartar. The submandibular lymph nodes often swell up with significant oral problems. If any of these problems exist, we recommend getting a full dentistry to clean and polish the teeth and start your pet’s dental chart. If your pet is receiving an anesthesia for another reason, and they have mild to moderate calculus and minimal gingivitis, then a light dentistry or ultrasonic or ‘hand instrument’ scaling of the outer teeth may be all that is necessary to prevent more extensive work in the future. It is advised not to do dentistry at the same time as another more sterile procedure as it could cross contaminate and complicate the primary procedure. Uncommonly, the odd dog will stand our technicians giving it a ‘hand descale’, using dental instruments with no anesthesia, to remove mild calculus on the upper outer dental surfaces. This is sometimes tried after the annual consult if indicated. We encourage clients to be proactive at keeping on top of their pet’s teeth at an early age. The easiest thing to do is socialize your dog to letting you into their mouth. You should teach him/her to let you lift up the lips to touch all the teeth and gently scratch them. Opening and looking down the mouth is not important for dental care, but it is a valuable tool to be able to do later on for a number of reasons. Ideally you should scratch the outer surfaces of the teeth once per week. If you can graduate to brushing once or twice daily, that would be of great value, but in the future scratching off brown build-up is going to be critically important to prevent tartar build up. Brushing by itself is usually not enough. Chewing rawhides and other soft chew toys, ideally daily, is a very good way to help keep the teeth clean. We recommend that all dogs get some degree of wellness testing every 3 years. This gives us a look inside the dog to see how the internal organs are doing. The CBC (complete blood count) evaluates the red blood cells, white blood cells and platelets, both in quantity , morphology and in the case of WBC’s the relative and absolute numbers of the various types of WBC’s (neutrophils, lymphocytes, monocytes, eosinophils, basophils). The biochemical panel measures a host of biochemical markers that are released, or accumulate, when certain specific organ systems aren’t functioning normally. For example, we look at the creatinine and urea nitrogen levels for kidney function, the ALT, ALP, GGT, bilirubin and AST levels for liver function. It’s not always black and white though, each one of these markers on their own can mean other things too. T4 levels are important to check in some dogs if unexplained obesity, poor hair coat and/or recurring skin infections occur, to name a few. SpecPLI assesses pancreatic function. Wellness testing may be combined with heartworm assessment. Goniodysgenesis (abnormal drainage angle development), is the most common cause of glaucoma in predisposed breeds. We suggest measuring intraocular pressure in your pet if he or she is one of the breeds predisposed to development of hereditary glaucoma. Some veterinarians recommend this screen with each annual or biannual check up. We recommend one or two “baseline normal” values followed by subsequent checks if eye disease develops. This will allow us to pick up on any abnormalities sooner, thereby allowing prompt treatment. Glaucoma can be quite painful and will lead to blindness if not treated early. Medications may be of benefit to manage disease in the early stages, but in most cases surgery is needed. Glaucoma is increased pressure within the eye “globe”. It results from a decrease in drainage of normal eye fluid. Constant production overwhelms poor drainage and pressure within the globe increases. This causes pain and blindness due to damage to the cornea, internal eye structures, the retina and optic nerve. It can occur as a primary disease (as above), or secondary to other eye diseases, such as lens luxation, uveitis, intraocular tumors or trauma. Almost all dogs should consider being on heartworm preventative in Southern Ontario, as this is the most common place in all of Canada. The endemic area however is Southwestern Ontario and Ottawa is not considered at all endemic. The incidence of heartworm in a given area will depend on what dogs are infected with adult worms, whether from infection the previous year(s), or from a move from an endemic area like the USA, or more towards Ontario’s endemic area. Rural areas tend to have more cases because the wild dog populations can host this parasite (wolves, coyotes) and more pet dogs are kept unprotected. The key times for heartworm prevention are between June and mid October. See other areas of this website (‘articles’) on information about this parasite. Briefly, mosquitoes pick up baby worms (microfilaria) from the blood of affected dogs where at least 1 female and 1 male worm resides in their heart. The microfilaria transforms and develops inside the mosquito which requires favorable environmental conditions, particularly warmth. Once at a certain stage in development, the mosquito transfers the worm larva to another dog in the area. This larva under the skin begins migrating to the heart of the dog, passing through the lungs first (it typically gets caught here in cats leading to coughing problems). In the heart the larva finishes transforming into an adult heartworm. Humans have also been known to become infected in endemic areas, and as such heartworm is considered a potential zoonotic disease. There are many preventative options for heartworm, which your veterinarian will go over with you. The differences are mainly what other types of preventatives, or therapeutic agents are included in the medications, and different modes of actions. The main difference is those with flea preventatives and those without. Some treat mange, ear mites and dandruff mites, but most treat current internal parasites as well. During the annual or biannual consultation we will take a moment to assess your pet for his/ her body condition scores (BCS- a score out of 5) and record its weight. A 4/5 score is >15% overweight, 5/5 score is >30% overweight. Please make sure you help us remember to weigh your pet at each visit to the hospital, regardless of what reason. Weight loss is an important indicator of underlying disease, or that you are doing a great job in solving a weight problem. Weight gain is a primary sign you may be over feeding your dog and maybe not providing enough activities to stimulate proper calorie consumption toward muscle building and fat burning. If weight loss is occurring we may encourage reassessing blood work and urinalysis. We’ll look more deeply into the past history, looking for explanations most importantly. If weight gain is occurring we will pay attention to the feeding pattern, nutrition and environmental enrichment factors. We will likely suggest a calorie restricted diet, and changes in the feeding pattern to start a weight management strategy. We have a mini weight loss visit we suggest, with our registered veterinary technicians to get you started on your own, or if the weight is serious (greater than 4+/5) we highly recommend entering our weight loss program which lasts 6-12 months depending on your pet’s individual requirements. This includes a rebound program to get your dog transitioned back onto a regular diet. Behaviour problems like separation anxiety, aggression towards people and dogs, barking, fear (thunderstorms, hot air balloons, etc), urination or bowel movements in the home, etc, all are potentially serious problems, because they can lead to giving up the pet, abandonment and euthanasia. Many people will spend a lot of money on fixing broken legs, ruptured tendons and days of hospitalization due to illness, but behaviour problems are often not addressed to the same vigor and financial commitment. Yet behavior problems are one of the main reasons people part with their pets. Veterinarians are often faced with pets for euthanasia because of behaviour issues, or very late in the frustration curve for assistance when euthanasia is well on the table. We are here to help you with these problems. Hopefully, we are all proactive in this area and begin a dialogue regarding issues when the pet is young and frustrations low. Veterinarians are a good source of information for all of these common behaviour problems. They often have years of experience dealing with pets and their behaviours. 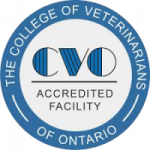 We have access on-line now to board certified veterinary behaviourists with our memberships in the Veterinary Information Network. We can also get phone consults with a specialist vet regarding your pet’s issues. Behaviour problems require significant time and financial commitment from the owner, which may be why they are under treated. Veterinarians need time to hear all the issues regarding the problem, and to formulate a constructive plan to address the problems in relation to the behavioural diagnosis. Once formulated, the veterinarian needs to have the time to educate and train the client on how to handle their pet in a formulated behaviour modification program. We have several levels of behavioral consultation at Beechwood Animal Hospital, but generally you start at level 1. It is hard in the annual consultation to do more than briefly help you with these issues, so it is far better to book a behaviour consult. We encourage all our clients to take their dogs for obedience training. We can’t understate the importance of having your dog be able to consistently respond to the basic directions of sit, down, stay, and come, whether Great Dane or Chihuahua. It is important though to pick the right trainer, because it is a buyer beware market out there, with no professional overseeing or regulatory body; philosophies vary. We strongly suggest finding a trainer with a Positive Reward Based Training philosophy. Basically you reward good behaviors, or behaviors you want to see repeated, and ignore undesirable behaviours or prevent them through situation avoidance. Clicker training is a very fast way to teach a pet your language. Using punishment or dominance philosophy often leads to increased anxiety, fear and aggression in dogs. Most of us can’t time, or give punishment correctly, if there is a correct way at all, without inappropriate negative energy. There are a lot of positive guidelines I believe you can get from Cesar Milan, the ‘Dog Whisperer’, but his dominance ideas and confrontation has caused a lot of concerns in the veterinary behaviorist community. His magic formula of correcting dog behavior we believe is really good**: 1. Exercise, Exercise, exercise (the walk) 2. Discipline (rules, boundaries and limitations), 3. Affection **key point being in THAT ORDER. Thinking of dogs’ needs as firstly an animal, then a dog, then the breed and finally the pet is good. Looking at your energy (your emotional state toward your dog in particular and to those around you), and how your dog may be mirroring your energy is an interesting self evaluation. We need to take responsibility and understand the implications of the energy we share with others and our pets. The idea of being calm and assertive, and praising your dog for being calm and submissive, should not be confused with over-powering your dog, hitting it, pinning it down, yelling etc. to get a nice, quiet, calm, happy, trained dog. Forcing your dog to do something is archaic. If they can train an elephant with just peanuts, and all the other zoo/ marine animals, you can train your dog too. Your treat is the payment for good behavior. None of us like to work for free and neither should the dog have to. The dominance heirarchy pack theory in dogs has been disproven decades ago; it has been shown that dogs have a family-like pack relationship among members similar to humans. So when behaviourists look at problem behaviours, their approach is more like how you’d handle things with your own children versus dominating, pinning down and forcing wills. © 2019 Beechwood Animal Hospital.